West Indies 3-274 (Ramnaresh Sarwan 120*, Kieran Powell 57, Hamilton Masakadza 2-27) beat Zimbabwe 8-273 (Craig Ervine 80, Hamilton Masakadza 60, Dwayne Bravo 6-43) by seven wickets. The West Indian skipper, Dwayne Bravo’s best career performance, along with the star batsman, Ramnaresh Sarwan, won them the 2nd ODI and series vs. Zimbabwe. Zimbabwe batted well and scored 273 runs for the loss of 8 wickets after the allocated 50 overs. The Windies reached the target by smashing 274 with seven wickets in hand and six balls to spare. Dwayne Bravo (West Indies) was declared ‘Player of the match’ for his lethal fast bowling as he grabbed 6-43 in 10 overs. The second One Day International of the three match series was played on Sunday, February 24, 2013, at National Cricket Stadium, St George’s, Grenada. Earlier, the captain of Zimbabwe, Brendan Taylor, won the toss and sent his batsmen in to open the innings. Vusi Sibanda along with Chamu Chibhabha started off briskly as the first hit 3 fours in the first two overs followed by one from the first in the next. The run rate was contained by the rival bowlers and they took the score to 39 in 11 overs as Chibhabha was clean bowled by Sunil Narine for 11 and was replaced by Hamilton Masakadza. 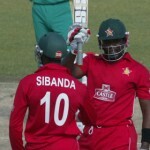 Sibanda continued with his attack and added 14 runs in the 12th and next over with 1 six and 1 four and scored his 18th ODI fifty in his 100th match. Dwayne Bravo got rid of two batsmen in the 19th over by removing Vusi Sibanda for 51 off 63 balls with 1 six and 6 fours whereas Brendan Taylor was unable to open his account. Craig Ervine joined in with Masakadza and both preferred to play their shots while sending the ball out of the fence regularly. The batsmen were getting sixes and fours at regular intervals and Masakadza attained his 19th ODI half century in the 35th over. The 100 runs partnership was registered in the 39th over and Ervine reached his fifth ODI fifty in the same over. Hamilton Masakadza became the next victim of Dwayne Bravo for 60 off 84 with 2 sixes and even fours. Malcolm Waller walked in next and scored 18 runs in the 43rd over off Kemar Roach with 2 grand sixes and 1 four. 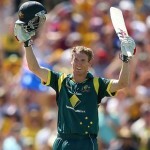 He was gone for 26 as the score touched 232 in 45 overs. The stumps of Craig Ervine were dislodged by Dwayne Bravo for 80 off 85 with 3 huge sixes and 6 fours as Zimbabwe managed 273 with two wickets in hand at the end of the 50th over. Dwayne Bravo was unplayable and grasped six wickets whereas Kemar Roach and Sunil Narine shared one wicket each. Kieran Powell and Ramnaresh Sarwan got off to a reasonable beginning and scored 44 runs from the first 10 overs. The batsmen added 19 runs in the next five overs as Powell hit his second six in the next over and he attained his 3rd ODI fifty on the third ball of the 23rd over with a four. The visitors got the first breakthrough at 111 on the fourth delivery of the 26th over from Hamilton Masakadza when Kieran Powell was caught behind by Taylor for 57 off 98 with 2 sixes and 4 fours. Darren Bravo lost his wicket in an identical way two balls later for a duck as Narsingh Deonarine got together with Sarwan. Sarwan got his fifty in the 28th over and Deonarine hit the first six of his innings in the 34th over. The pair was playing a calculated innings while keeping in view the required target in mind as Sarwan hit another 3 fours and 1 six in the 36th and next over. The master batsman Ramnaresh Sarwan added another six on the fifth delivery of the 40th over and thrashed his fifth ODI hundred on the very next ball. The Caribbeans required another 65 runs to win the game in 48 balls as Sarwan added 2 more boundaries in the 43rd over. The score was enhanced to 219 in 43.2 overs as Narsingh Deonarine was run out for 42 runs. Kieron Pollard changed the complexion of the game with his aggressive style of batting and hit 1 six and 1 four in the 45th over followed by three more fours and 1 six in the next three overs. The target was achieved on the last ball of the 49th over as the Windies piled up 274 runs for the loss of just three wickets. Ramnaresh Sarwan was unbeaten for 120 off 143 comprising 2 sixes and 9 fours whereas Kieron Powell secured his end with 41 from just 20 deliveries with 2 sixes and 4 fours. Hamilton Masakadza was the only bowler who impressed by claiming two wickets as the rest of the bowlers were unable to take a single wicket. West Indies won the second ODI by a huge margin of seven wickets and leads the three match series 2-0. The third and final game of the series will be played on February 26, 2013, at the same venue.